Training For Warriors (TFW) started 19 years ago to train and prepare the world’s best in combat sports. 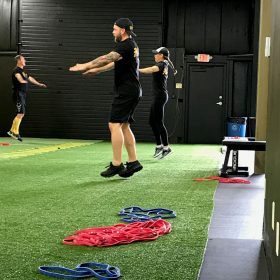 Over time, the founder Martin Rooney, realized “you don’t have to be a fighter to train, look, and feel like a fighter.” TFW is a fitness system unlike any other fitness system in the world. It isn’t designed for competition or sport between you and other people. It’s designed to get you to compete with yourself and challenge your body, mind, and spirit. Today, there are certified world-class coaches in over 275 locations spread across the globe in over 30 countries. TFW is a system for ANYONE with a desire to become more than their current self and BURN FAT, BUILD MUSCLE, and FEEL GOOD. 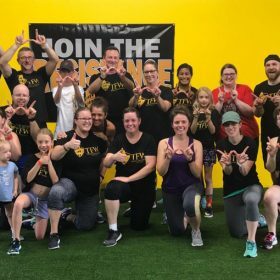 Using a holistic and scientifically proven approach to health and fitness the coaches at TFW Madison are here to deliver a world-class service. Our only desire is to help you become something more. Coach Jonathan Nolan delivered this system in Minnesota for a number of years. Our mission as a global network is to improve the life and health of as many people as possible. Coach Jenny and Jonathan felt Wisconsin was missing this opportunity. We are here to serve and help you get your life to the next level. It’s not the workouts that makes TFW Madison special. The workouts are awesome but it’s the culture created and maintained. We brings lots of positive energy, group accountability, and more support than ever before to keep you moving forward. It’s a place some refer to as the “light of my day” or “my happy place.” Every class is a rock show of positive energy and intensity. It’s a family friendly place to leave life at the door and focus on you. Stephanie worked hard to earn February Warrior of the Month! 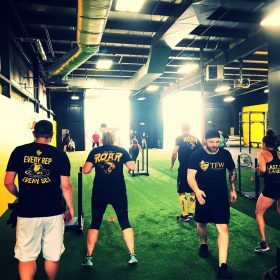 Come check us out and try a trial class! Jonathan is a husband and father of two. He loves being outdoors. He loves to help people become a better version of their current selves. His credentials include: Bachelor of Science in Exercise Science from Concordia University, St. Paul, MN, Associates Degree in Personal Training from St. Paul College, St. Paul, MN. NASM Certified Personal Trainer, Training For Warriors 1 & 2, Corrective Exercise Specialist, Performance Enhancement Specialist, Weight Loss Specialist, Precision Nutrition Certified, CPR/First Aid Certified. 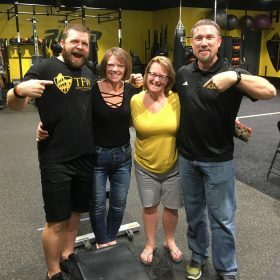 Jonathan became a TFW coach in 2014 and has attended multiple TFW seminars. He began his work in health and wellness in 2010 and has learned the benefits of working in a more intimate environment with a well-formed and always-growing philosophy.